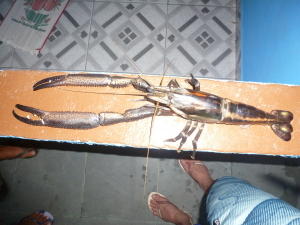 A prawn of lobster proportions, Macrobrachium carcinus, was caught in the Guapiaçu Reserve last week. This tortoiseshell creature, known locally as the Pitu, is one of the largest species of freshwater prawns, known to reach 12 inches (30 centimetres) in length and up to 850 grams in weight. The Pitu is considered important economically, as it is commercially fished in northern and north eastern Brazil, but Nicholas Locke, President of Reserva Ecológica de Guapiaçu (REGUA), WLT’s conservation partner in Brazil, has reported that they aren’t often seen in the Guapiaçu river due to overfishing. Nicholas said “Most of the locals talk wistfully about this fresh water crustacean as many of the streams within the Guapiaçu watershed close to small villages have been fished out. The days of big fish in the rivers have become a thing of the past. 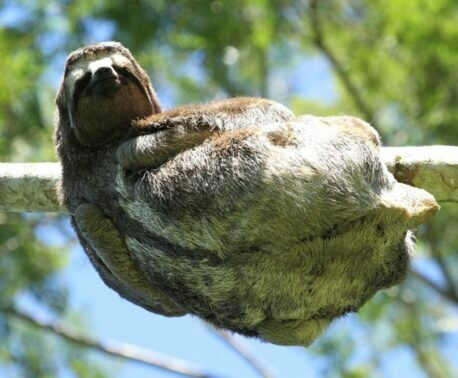 Although the Pitu is widely distributed from Florida southwards to southern Brazil and is not considered under threat by the IUCN, it is locally threatened in the Atlantic Forest. Finding this specimen is an indicator of high water quality in the Guapiaçu river, which is an important water supply for the surrounding community. The individual found was particularly large, which usually indicates a highly aggressive male most likely in control of a large territory, in shaded areas of aquatic plants and rocks. 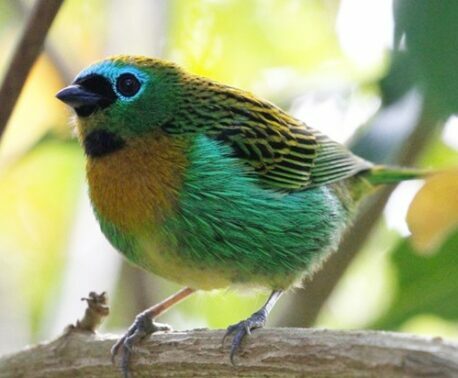 The Atlantic Forest habitat REGUA protects is bursting with biodiversity from a wide diversity of woodland types, but is under threat from illegal logging, land clearance for agriculture and urban development.